Sportsstuff inner tubes are marked by their special designs that deliver new and exciting towing experiences. The same old donut-shaped inner tube gets old after summers and summers of use. Look to Sportsstuff when you’re ready to switch things up for your beloved riders. 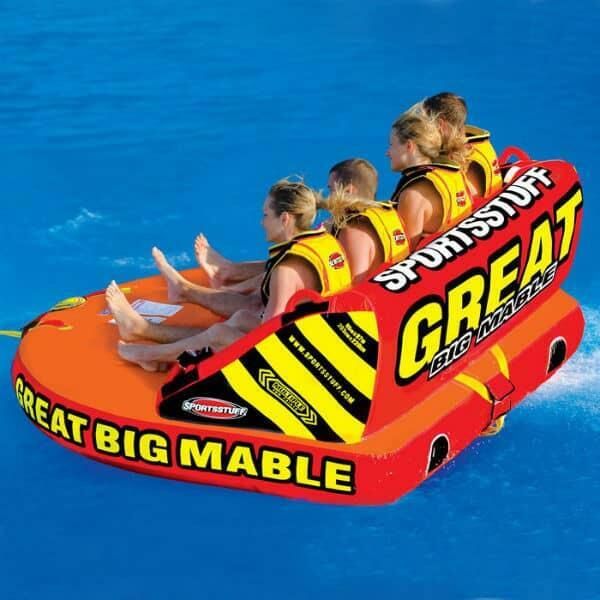 The Great Big Mable allows for four riders to comfortably enjoy a new thrill. The Great Big Mable features dual tow points so that you may enjoy the ride in two different styles. From one side, riders sit with a comfortable high backrest. When towing from the other direction, riders kneel. The patented aluminum quick connect tow point and speed safety valve save time by keeping the tube inflated and in tip top condition. That means fewer trips to the dock to attend to losing air or holding water. The Great Big Mable is equipped with a double stitched full nylon cover and heavy gauge PVC bladders to keep the Great Big Mable in mint condition for the seasons and years to come.